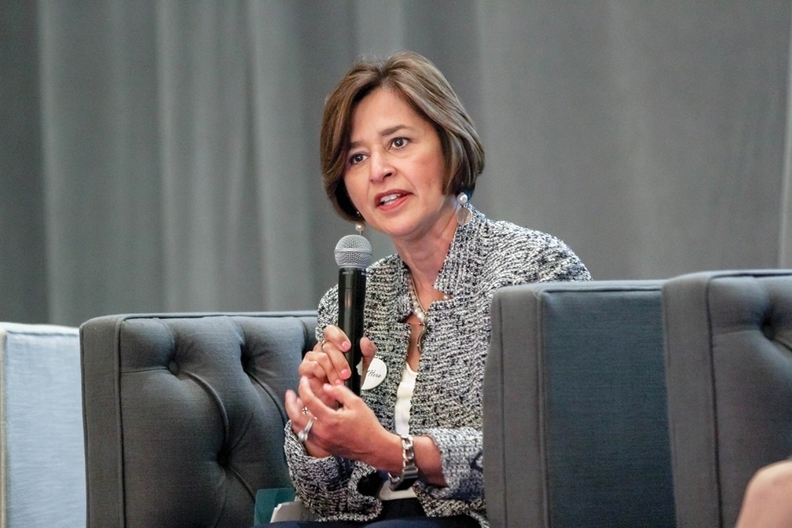 Debra Canales, Providence St. Joseph Health executive vice president, said every caregiver knows sexual harassment has no place at her organization. To my colleagues, I was the composed human resources executive who worked hard to protect employees. Only those closest to me knew that my workplace was a sanctuary, a refuge from the chaos and darkness at home. For years, I chose not to mention the events that shaped who I am today as a survivor of domestic abuse and an advocate for safety at home and in the workplace. I am sharing my experience more broadly now because this issue can no longer be silenced. I hope that, in coming forward, I can empower others and help move them into action. I can assure you that you know someone struggling with this pervasive problem. One-third of women and one-quarter of men have been victims of violence by an intimate partner within their lifetime. Add to this toll the number of people who suffer from emotional and physical abuse in the workplace. It is simply too much. The organization I work for now was founded by courageous women committed to social justice. The Sisters of St. Joseph of Orange and the Sisters of Providence recognized the dignity of each person they encountered and worked to root out oppression of all kinds. I knew I'd be standing on the powerful shoulders of these women and of my own Aunt Trini, a provincial of a convent, but little did I know how much I'd need to lean on them for guidance in this time of breathtaking societal change. I've often wondered how they would respond to #MeToo and #TimesUp. Intensely aware of the #MeToo movement and the events of the past year, my organization is responding with #NotHere. That means we do not tolerate harassment or abuse of any kind. Guided by our mission and core values, we stand with those who have come forward and work to root out abusive behaviors. Of course, a hashtag is just a social expression of this work. We are making this meaningful through action and embedding this work into our culture, just as we do with safety initiatives. We are looking at all facets of our organization and using the tools that aid in clinical excellence—such as our work related to high reliability. We are strengthening policies and training. Our focus applies to any kind of abuse and harassment, including mistreatment based on sexual orientation, race and power differential. We are also empowering caregivers with the tools to ensure a safe environment. Our people know they can report issues to supervisors and human resources, as well as through a confidential hot line. Our goal is for everyone in our organization to understand the importance of bystander intervention and speak up when they see or suspect harassment or abuse. To get this right requires a culture that honors the dignity of every human being and celebrates diversity. And, as compassionate caregivers, we need a strong sense of justice, rendering assistance to those who are currently vulnerable. I understand that this issue is deeply personal. I was lucky because I benefited from the wisdom and support of real-life angels who empowered me to free myself and eventually flourish. I'm determined to pay it forward, dedicating myself to caring for people—mind, body and spirit. It's time for us as leaders to take a stand. The courage we show now, in this time of intense societal change, will inspire others to drive the kind of cultural shifts that will last. Let's find that courage and pass it along. Debra A. Canales is executive vice president and chief administrative officer at Providence St. Joseph Health, Renton, Wash.